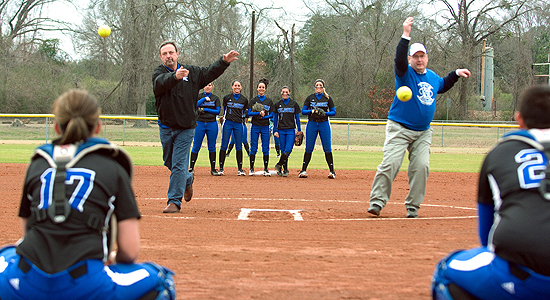 (Above) Local businessman Mike Clements and KC Board Member Will Roberson throw out the honorary first pitches at the first-ever Ranger Softball home game at Stream Flo Park in Kilgore on Feb. 4, 2013. Photo © Les Hassell/Longview News-Journal – Used by Permission. Kilgore College added women's softball to the athletics department for the 2012-13 school year. This year marks the third season for the Ranger Softball Team. Coach Leslie Messina enters her second year as KC's head coach, coming to KC from Texarkana College where she coached for eight years. KC took the place of Texarkana College in the Region XIV East Conference because Texarkana College dropped all intercollegiate athletic programs after the 2011-12 school year. At Texarkana, Messina's teams won five conference championships, two regional championships and had the school’s first two appearances at the NJCAA National Tournament.